JR, The Black Entertainment Guide: NBA star Shaquille O'Neal engaged to Reality Star Hoopz? 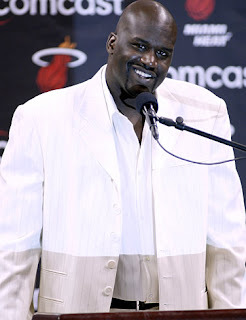 NBA star Shaquille O'Neal engaged to Reality Star Hoopz? Recently, the rumor mill has been overflowing with news. More recent news has the newly-single Shaquille O'Neal getting back into the dating game. For the past three years, Shaq has been divorcing Shaunie O'Neal, his wife since 2002. But, a short reunion, followed by a reality show has left the two apart again. Ever since "Basketball Wives" went on hiatus, there have been rumors about Shaunie O'Neal finding a young boy toy. But, things have not been so smooth for Shaq. He was hoping to play sidekick to LeBron James in Cleveland for a few more years, but James bolted to Shaq's former home of Miami. Two years ago, Shaquille O'Neal left Miami kicking and screaming, but he was pleading for them to take him back. In an effort to keep the Miami Heat drama free, the organization decided less is more and left Shaq to fend for himself. Soon after landing with the Boston Celtics, O'Neal sought to put himself in the middle of entertainment news. Ever since her affair with Real on VH1's "I Love Money," things have been rather silent from Hoopz, too. There have been a few rumors of her beinga lesbian, but not much was proven. During her time on the mega hit, "Flavor of Love," New York tried to insist Hoopz was gay. But, in the end, she broke Flavor Flav's heart, along with VH1's heart when she turned down a reality show spin-off. While 2006 was a great year for both Shaquille O'Neal and Hoopz, 2008 was not and it ended up proving to be their last year in the spotlight. In the time since, the NBA has moved on to their love affair with Kobe Bryant, Dwyane Wade, and LeBron James, while VH1 has found more success with Terrell Owens and Chad Ochocinco. Putting themselves back in the news, one more time, rumor has it Shaquille O'Neal and Hoopz are engaged and will wed sometime before the end of this year.